Stilt houses or pile dwellings or palafitte are houses raised on piles over the surface of the soil or a body of water. Stilt houses are built primarily as a protection against flooding, but also serve to keep out vermin. The shady space under the house can be used for work or storage. Our concerns for these areas are how to manage their wastes particularly feces, and where they obtain the water to drink and for living. As mentioned earlier, if they defecate directly into water from their houses and collect water to drink from the same location, they will be in great danger. We would like to have information on this matter; how they are living. The lagoons and wetlands are popular facilities which have been used both in developed and developing countries. These are particularly good for tropical areas. These are installed in two regions in Cambodia; Sihanoukville and Siem Reap. It appears the lagoon in Sihanoukville needs upgrade. 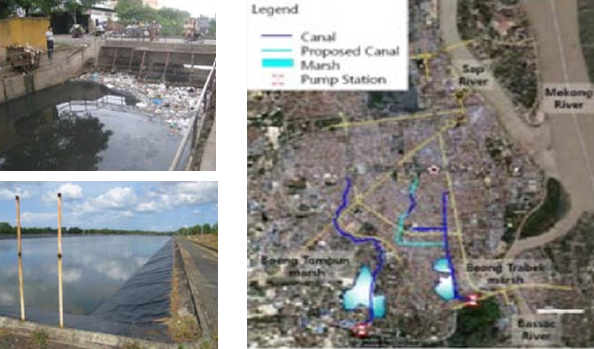 The capital city of Phnom Penh has largely been depended on the existing natural wetlands (Boeng or beong) for their wastewater treatment, but they are discharging some of their wastewater directly to the Mekong river. We are interested in this natural treatment system. the locations of the wetland. Below show the lagoon operating in Sihanoukville. Large communities install septic tanks, but the accumulated sludge is not removed periodically. If not removed properly, there will be negligible removal efficiency. Generally, septage is removed once every one to three years. Needless to say, the removed sludge must be managed properly. In addition, the efficiencies vary greatly depending on its structures with and without baffles, and number of compartments. We are interested in upgrading the septic tank efficiencies. Industrial wastes sometimes contain toxic substances and heavy metals threatening for public health. Hospital waste can also be easily assumed to spread pathogens without proper management. Tannery waste and landfill leachate present high organic discharges with dark colors. Such wastes must be carefully managed.